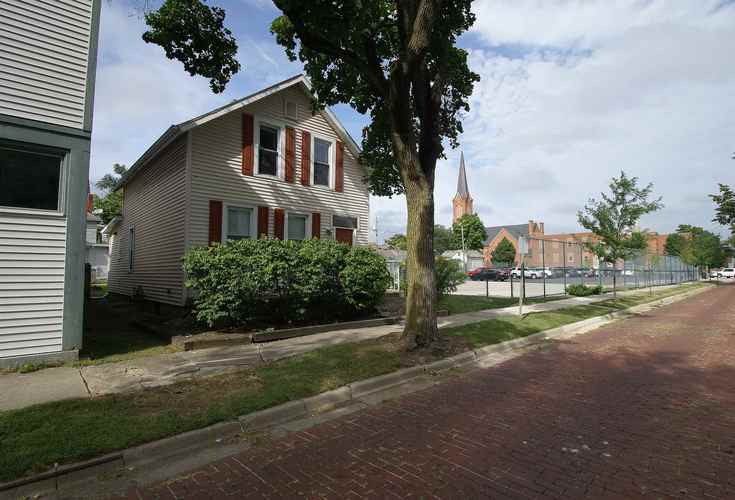 **CONTINGENT - ACCEPTING BACK UP OFFERS** Welcome to The National Register's Historic WEST CENTRAL Neighborhood!! 4 Blocks North of the $300 MILLION Dollar Plus Electric Works Project. Affordable Downtown Living. May be the last chance to Buy Anything in this Area for under $80k. This Home sets on a Cobblestone Street right next to a green space & Church. Updated 128 Year Old Home. Newer Kitchen with Tile Floors, Custom Modern Cabinets, Glass Tile Back Splash, Brushed Nickel Faucet & Hardware PLUS Stainless Steel Refrigerator, Dishwasher & Smooth Cook Top Range. HUGE Dining Room with Laminate Flooring. Great Room with Can Lights & Laminate flooring. Large Master Bedroom with Double Windows & Frieze Carpet. Nice sized 2nd bedroom with Frieze carpet. Small 3rd bedroom good for an office/den or walk In closet. Full Bath with Tile Flooring & Tile Shower. Washer & Dryer on Main Level. Small Low Maintenance Yard. Exterior Almost All Maintenance Free. Great for an Air BB or Rental ($850 a month) Close to All the Downtown Action & Development. Cash or Conventional. No BACK YARD to this house. The Biggest part of the yard is between the Street & Sidewalk. Broker Owned. Directions:W. WASHINGTON TO JACKSON, GO SOUTH TO WILT ST. (ONEWAY STREET GOING WEST) TURN WEST FIRST HOME AFTER CHURCH ON NORTHSIDE OF THE STREET.